According to a recent study, a majority of drivers admit to aggression and dangerous behaviors known as “road rage” while behind the wheel. Approximately 80 percent of U.S. drivers say they have displayed road rage, anger, or aggression one or more times in the past year. The AAA Foundation for Safety survey says eight million drivers have admitted to extreme behaviors while driving. 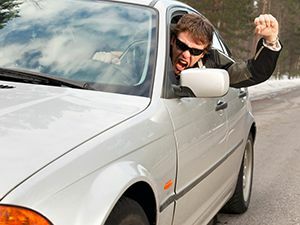 Commonly considered road rage, these behaviors include purposely colliding with another vehicle and confronting another motorist outside their vehicle. Tailgating is the most common aggressive driving behavior, which involves following another vehicle too closely, and is performed by approximately half of drivers in across the country; about 104 million total drivers. About 50 percent of drivers say they have yelled or honked their horn at another driver to express their anger or aggravation. Nearly one-third say they’ve gestured angrily at another motorist. Drivers who are most aggressive behind the wheel are males ages 19 to 39 who are three times more likely to exit their vehicles for the purpose of confronting another motorist or to have collided purposely with another vehicle. If you’re a victim of injuries from a road rage incident, contact our personal injury lawyers in Tulsa today. Aggressive driving behaviors and road rage have the potential to cause auto accidents, as such behavior pulls focus away from the roadway and the task of driving. A representative from the foundation warns that this anger and behavior can turn deadly. Aggressive driving is a major contributor to fatal accidents and is on the rise. An overwhelming nine out of 10 drivers feel that aggressive driving is a significant threat to their own safety. More than half of U.S. drivers feel road rage is a larger issue than the foundation’s previous study, conducted three years prior to this 2014 survey. According to the National Highway Traffic Safety Administration, an estimated 66 percent of accident deaths involve aggressive driving behaviors. Were you injured in an accident caused by another driver’s road rage? If so, you may be entitled to compensation for resulting medical bills, lost wages, and pain and suffering. The experienced team of auto accident attorneys in Tulsa at The Edwards Law Firm will review your case, free of charge, and inform you of your legal options. Schedule a consultation today.